On the 25th November 2013, Capital Services Ltd was supposed to install new locks on the bedroom doors and seal the rooms in order to minimise the spread of the dust. 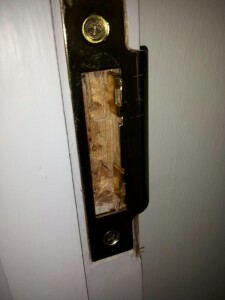 The workers also supposed to change the lock on the entrance door. In the end they couldn’t do any of those jobs because they had the wrong locks or the locks did not fit on the correct position. Also they carried some works without covering the wooden floor upstairs or the stairs. The new bath was also not protected during the tiles removal. 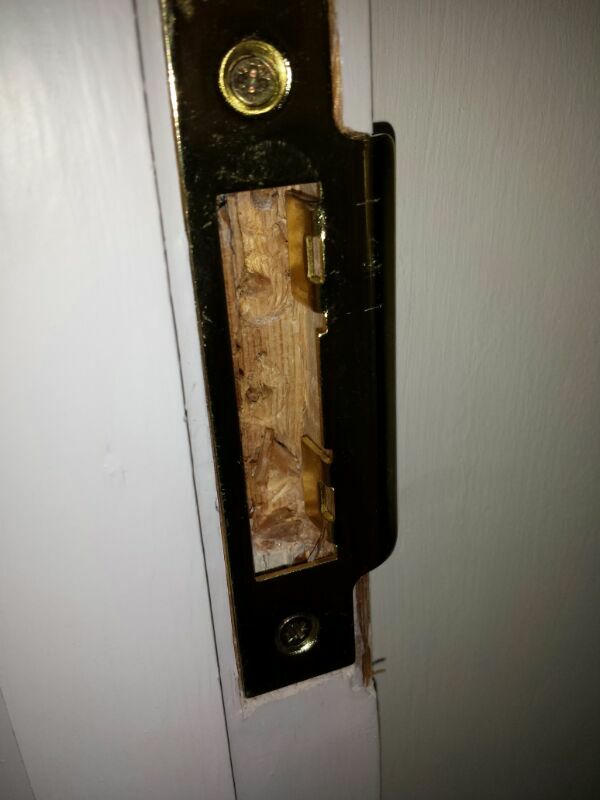 On the 26th November 2013, they managed to find the correct locks for the bedrooms which they installed. In the process of installing the new locks they destroyed the door frames. See photo on the right. This means that they will have to replace the door frames and possible paint the whole flat again. The contractors have finally installed some covers on the floors and stairs. Unfortunately I did not have the chance to check for any damages on the floor due to their repairs yesterday. A small selection of the photos can be found here. To see all photos in their full resolution click here. On the 01st December 2013, I have discovered that the contractors might have thrown their hazardous and toxic solvents down the toilet sink. 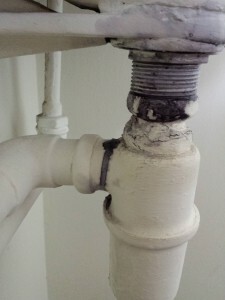 The plastic waste pipes seems to have melted or cracked and some mixture of water and chemicals have leaked on the newly installed adhesive. A Arditex N/a Latex will then be applied to protect the dpm in preparation for block flooring. The liquid STOPGAP F76 is blue and it is similar to the marks on the entrance door’s handle and the pipes below the sink. 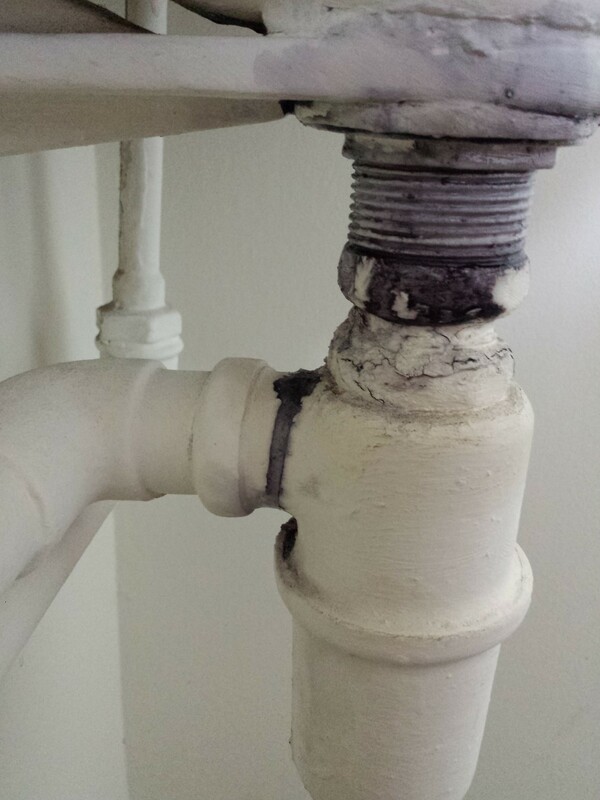 According to the government website the subcontractor might have not shown “duty of care” by throwing BAL F76 solvent down the sink. On page 10 of the guide to the Hazardous Waste Regulations you can see that solvents are dangerous and have to be disposed properly. A small selection of photos showing the different damages can be found here. while the full resolution photos can be found here. In the end Burgoynes was instructed by Zurich Insurance Plc to do a survey. The engineer came on the 20th January 2014 to my property. During his survey he did not remove the lower part of the sink in order to check the inside for chemicals as per the original suggestions. 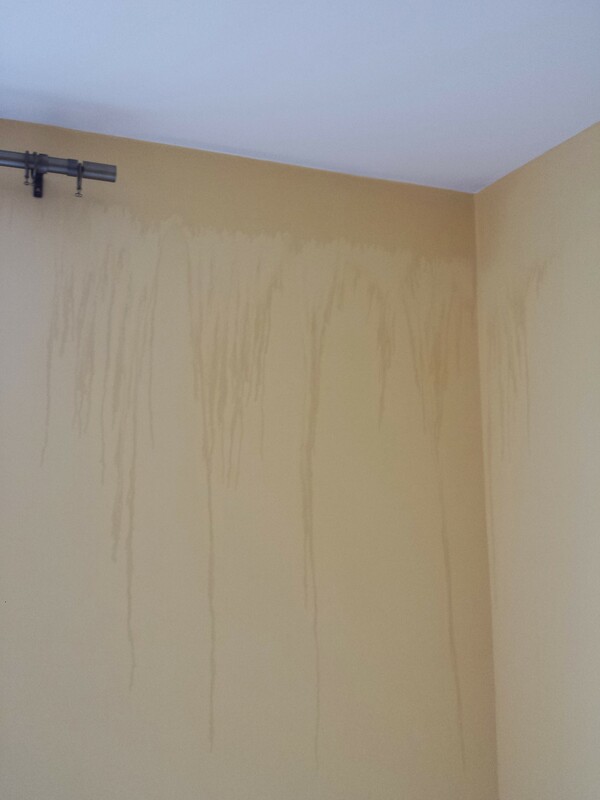 His preliminary conclusion was that there is a tiny leak. The quantity of water on the floor was big because the tap was left running for days. However, we are still waiting for the full and official results.